The Oppo Find X blends a seamless body style with unique functionality, and popular features like Google Lens. Oppo has officially unveiled its latest smartphone, the Find X, which follows some industry trends but deviates from others to attempt at offering something unique enough to capture the consumer’s attention. The most noticeable thing about the phone is that it comes with a nearly bezeless screen that has no notch, a trend which more than a few smartphone manufacturers have implemented in new phones for 2018. Oppo on the other hand has chosen to forego this particular trait, citing that it believes in beautiful design, but to combat the loss of an area on screen where the front-facing camera would have been, Oppo has instead chosen to implement a hidden camera design which it calls the Stealth 3D camera, complete with mechanical components that will slide the camera module up int view when the user is ready to take photos. 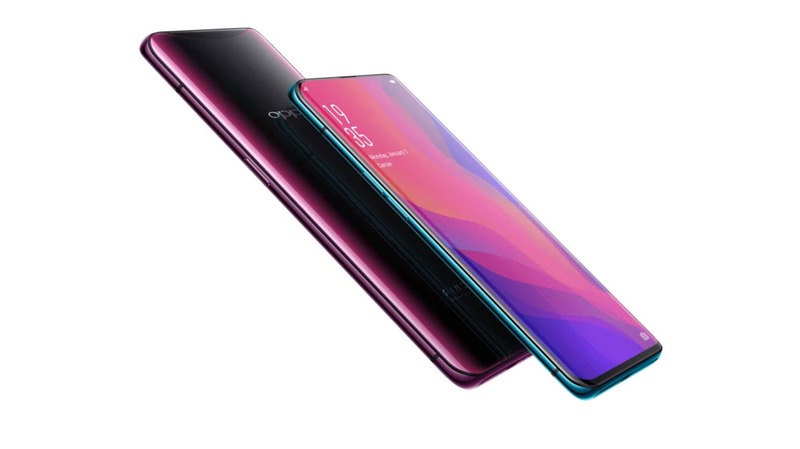 Implementing a no-notch design has allowed Oppo to take the utmost advantage of the display real estate, providing consumers with a phone that houses a 6.4-inch display with a 19.5:9 aspect ratio, and more importantly, perhaps, a screen-to-body ratio of 93.8-percent which is slightly higher than the one on the recently announced Vivo NEX which comes with a screen-to-body ratio of 91.24-percent, not to mention with a 6.59-inch display. So in retrospect, with a technically smaller display by the numbers, Oppo’s Find X is actually giving users more screen to work with than the Vivo NEX. Oppo also calls the display a Panoramic Arc Screen, which combines two pieces of glass with the front display to create a panoramic view effect. As mentioned above the Oppo Find X will come with a 6.4-inch display, using an OLED panel and coming with a Full HD resolution. Not to be outdone on the processor side of things the Find X comes powered by the Qualcomm Snapdragon 845 processor, complete with 8GB of RAM for the memory and multiple variations for the storage options all the way up to 256GB. In total there will be two variations of the phone, one with 6GB of RAM and 128GB of storage, and the other one with 8GB of RAM and 256GB of storage. It will also support expandable storage via microSD card. For the battery the Find X comes with a 3,730mAh capacity battery which can be charged back up via USB Type-C, and although it doesn’t use Qualcomm’s QuickCharge technology it can still be charged back up rather fast thanks to Oppo’s VOOC Fast Wired Charging. The cameras seem to be the real star here, with the Find X sporting a 25-megapixel A.I.-enhanced 3D camera on the front of the device for selfies along with a 3D facial scanning system, and a combination of a 16-megapixel sensor and a secondary 20-megapixel sensor on the back for the dual camera setup for main images. It runs on ColorOS 5.1 for the software which is based on Android 8.1 Oreo, and it’ll be available in two different color choices which are Bordeaux Red and Glacier Blue. The phone will be Dual-SIM compatible which means you can use it with two different services at once, which will be important since this will be the first Oppo device officially sold in Europe and North America according to the company, and for connectivity it supports Bluetooth 5.0 as well as Wi-Fi 802.11a/b/g/n/ac. The Find X will also come with Google Assistant and be part of the Android P beta, which means users who buy the phone will get access to the latest software before Google pushes the final build. The design of the Oppo Find X is the focal point of this device, with Oppo stating during its launch event that it believes in beautiful design that can still offer useful functionality. The Find X showcases its design-forward appearance with the seamless Panoramic Arc screen before anything else, but flip the phone over to the back and you’ll see the gradient colors that Oppo built into the phone using a “unique process” that allows the colors to shift slightly in different light, not too unlike what HTC has done with some of its most recent phones. The design-focused choices don’t stop there. As mentioned earlier the phone comes with a hidden camera module which Oppo calls the 3D Stealth camera, which hides within the frame of the phone until it’s ready for use. This helps keep the seamless design of the phone looking elegant, making the front of the device all about the display and the user’s ability to interact with it, and the back of the device about the shifting gradient colors. The phone doesn’t feature a headphone jack and will instead use the USB Type-C port for audio when plugging in headphones. The SIM card tray is also located on the bottom of the device along with the speaker, while volume left and right buttons are located on the left side of the frame, and the power button is located on the right. While design is the main focal point of this device, the cameras are also an area of the phone that Oppo seems to have taken a keen interest in. On the front the Oppo features a single camera sensor – a 25-megapixel camera with A.I. capabilities. In reality there are two camera sensors on the front but only one of them which you can see, while the other is an infrared camera hidden under the glass of the camera module that is used for the O-Face facial recognition feature that helps the user unlock the device. This technology uses 15,000 nit facial dot recognition which Oppo boasts is 20 times safer than using a fingerprint. As for the selfie aspect the device uses a host of other hardware to provide users with great shots including flood illuminators, a ranging sensor, and a dot projector. The front camera can also be used for the 3D emoji feature for livening up your chats. As for the back cameras, the two sensors are accompanied by Optical Image Stabilization, Phase Detection Autofocus, Dual-Tone LED flash and f/2.0 apertures for both sensors. The Find X is a fairly large phone with plenty of screen, as well as a powerful processor and loads of RAM to help with all that needed battery life Oppo included a 3,730mAh battery to keep the device powered on throughout the day. The battery also charges back up using Oppo’s own technology, called VOOC Fast Wired Charging, and given that the device comes with USB Type-C the phone should be able to charge back up pretty quickly so users won’t have to wait long to get enough juice to continue using the phone for the remainder of the day if they have to stop to charge it up. While the device comes with Android 8.1 Oreo software through ColorOS 5.1, which is Android’s most secure version of software to date, the Find X leaves out any inkling of fingerprint security and chooses instead to use the front camera and its O-Face technology for facial recognition to unlock in a hands-free way. As noted above Oppo says this is 20 times more secure than using a fingerprint sensor for a device unlock, and there’s no need to add smudges to your device. Oppo hasn’t announced any official date for a release yet, but it does mention this will be the first phone that it is officially going to sell in North America and Europe. There’s no pricing information for North America yet, or any confirmation that the U.S. will be included in the North America launch for that matter, but European consumers will be able to pick up the phone for €999. Oppo also mentions the phone will ship to customers in August of this year, though it does not elaborate on whether or not this includes both Europe and North America together or just Europe. The post Oppo Find X Is Nearly Bezeless With A Hidden Camera Module: Everything You Need To Know appeared first on AndroidHeadlines.com |.